Fits most 4 inch (100mm) and 4.5 inch (115mm) angle grinders. 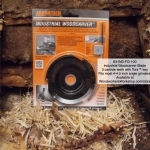 Suitable for carving, cutting, shaping, trenching and trimming wood. Highly recommended to be used with the Arbortech™ Pro-Guard #63-ACC-FG-100. This accessory tool can be used with the Arbortech™ product line of power carving woodworking tools.